All meals are included in the price per head and are freshly prepared onboard, Trinity, in our galley by our experienced catering team. Tasty wholesome home style dishes are created daily. A firm favourite on the menu includes a wide range of well-loved, tried-and-tested homemade cakes! We source our meat from our local butchers in the village, fresh fruit and vegetables from a local supplier, fresh bread delivered daily from our local bakery, free range eggs from a local farm supplemented by deliveries of sundries and other items during the week. Vegetarian options are provided at every meal and we are experienced at catering for all dietary requirements. 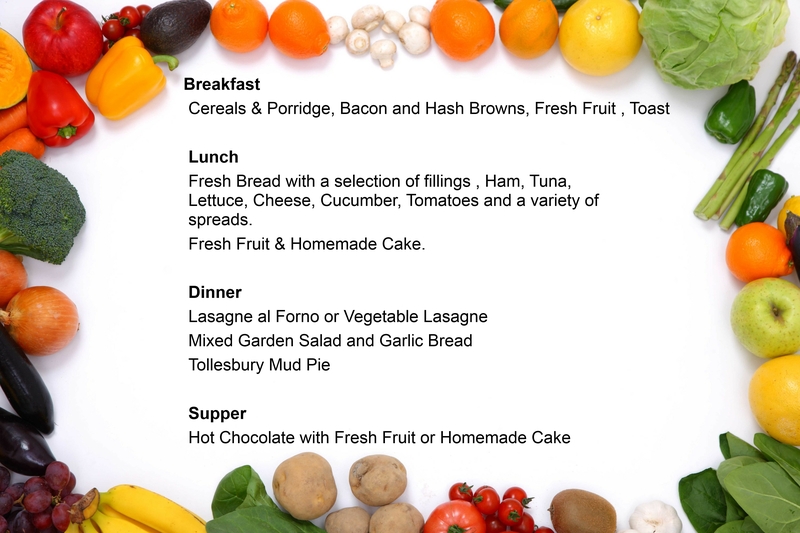 If you have any queries regarding any dietary requirements for your stay further than those specified on your booking form, please don’t hesitate to contact the office. “I just wanted to write to say a very big thank you for making the food sesame free & safe for my son last week. Thank you to your Chefs & all staff. He had a wonderful time & was able to eat the same as his friends & feel completely included. My husband & I could also relax knowing he was safe.